Right on time for Oscar night, we publish excerpts from a master class Best Actor nominee Colin Firth held at the 2010 Taormina Film Festival in Italy, having just finished the work on The Kings Speech. The film nominated for a whopping total of eleven Oscars - Best Picture, Best Director, Best Actor, Best Supporting Actress, Best Supporting Actor, Best Original Score, Best Film Editing, Best Cinematography, Best Sound Mixing, Best Costume Design and Best Art Direction - and won the two most important ones - Best Picture and Best Actor for Colin Firth. How do you respond best to a director? Colin Firth: There is no absolute manual on how to direct a film. It's and extremely unpredictable human process, a combination of human beings. There are of course techniques, but every case is different. A director who is brilliant for me may not work for an another actor. Does it come down to personal relationships outside of the work? Colin Firth: It's not necessarily outside of the work but it is personal relationships. One of the most essential skills of a director is personal. You have to have a vision and the story to tell. You dont need to know about the camera or the lighting, but you have to be able to communicate your vision. The best directors dont necessarily do that with words.There are directors that speak very little. Tom Ford never told me how to do anything. But when you arrived on the set there was a clear feeling of the world he wanted you to participate in. In Cannes, I was witnessed a conversation between an Australian Director and Juliette Binoche. She listened to the project and was lovely. But at the end she said your project sounds fascinating but I would never work with a first time director. You seem exactly the opposite. Inexperience doesnt bother you so much as long as you believe into the project. Colin Firth: I couldn't work according to rules like that. If you are dealing with something as nebulous as story telling you cannot fix rules as precisely as that. If you rule out all first time directors, you will be ruling out the first film of every great director we have ever seen.I think there are other ways to judging this. There is an instinct you have. There needs to be rapport and engagement with the subject of the film, the world of the writers, the world of the characters. Tom Ford had that. I was completely free. How much of the effect of a scene depends on the editor? Do you ever feel at the mercy of the director or the editor and the director? Colin Firth: We are all at each others mercy. A Director cannot actually make a performer happy.A good editor will also save you. Yes, I have gone into despair when I saw final cuts, butI also said Thank God the cut there so it literally cuts both ways. You worked a lot with the British film industry where there seems to be a class-based bias saying If its' not a working class I am not interested. Colin Firth: There is definitely a very clear division according to class in British cinema. BecauseI am associated with middle class cinema they put me in costume. It is very rare you get current stories on middle class. Almost everything contemporary needs to be working class. I find it infuriating that only working class has the right to have emotions in cinema. Colin Firth: It is true. You are deprived of representing what you are. As a matter of fact, I didn't get a very posh education. I had a state education in a predominately working class environment. I didn't speak as I speak now when I was a child. Has that stymied you with the roles you are getting? Colin Firth: Until I got through drama school had no idea that I was going to be pigeon-holed in patrician and middle class roles. I thought I could play punks and pimps well. But because of our class system that was not possible. Daniel de Lewis escaped that, although he is more patrician than I am. He established diversity very early He did Room with a View but also My beautiful Launderette. 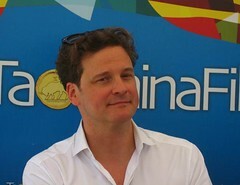 Colin Firth: Yes - it is about King George, the father of Queen Elizabeth, the present queen. It is set against the abolition crisis. That was a constitutional crisis. The king of England abdicated the throne to be with his girlfriend. She was not only American but also divorced. That is a well-known story.The story that is not told very often is about his brother who had to become king although he was not prepared at all. He also had a chronic stammer. This was when live radio broadcast was the essential job of the monarchy. His job was to speak brilliantly live to the entire empire. This is the story of the speech therapist who never completely healed him but got him to the point where he could speak with a certain gravitas and he became a popular king. This was of course at the beginning of the War, and the adversaries were the best speaker of the time, Mussolini and Hitler - this is what he was up to. You are playing posh again. Colin Firth: I am playing very posh! I wonder if there are performances today that impress you by one of your peers. Colin Firth: What I admire most is acting that really is inconspicuous. I think Robert Mitchum said Dont ever let them catch you acting. Two performances I really liked are Heath Ledger in The Dark Knight and Daniel de Lewis in There will be Blood  but both are really acting. Colin Firth: When I said it has to be inconspicuous I dont mean it has to be small. There is no such thing than as over the top as long as you fill it and as long as the content is there. You dont normally expect to see virtuosity in an action film - it is pure brilliance. When you what this guy is doing you dont' see the acting - you see complete insanity.Everything is absolutely authentic. The behavior of the joker is inconspicuous. It's the same with Daniel and There will be Blood. I see the driven man. It can be as big as you want, but you cant let the acting show. Why have you stayed so loyal to the British film industry? You resisted the call of America. You've done some of the better British films over the last years. It is almost quixotic. Colin Firth: I am always afraid of that question. I just don't know the answer. There was not really that much of a call by Hollywood. There is not that life that was waiting for me.Even after Bridget Jones, it wasn't tempting. It's not loyalty, its not virtue, it is quite simply preference. I don' think you can never extend yourself or travel beyond your territory, but every person feeds on their roots. Resources have to mean something to you. If you are a story teller you have to be where the stories are. Collaboration is an essential part of my business. It doesnt have to be cronyism or a festival of reassurance. By developing relationships, by keeping in touch with the stories of your culture, your political life, by observing your own universe, I believe if I leave it behind altogether I would loose. You can immerse yourself in other people stories, but as a base I feel more connected at home. I feel more animated and alive if I am based in London than if I were to base myself in Los Angeles. I spent a lot of time in LA and there is a lot about that place that is very productive. What compelled you about A Single Man? that was fascinating to me. Your performance is almost a full mask performance, doing infinite amounts with repressed facial movements. Is that the kind of acting that you find rewarding? I imagine Tom Ford said you have to be stoic. Colin Firth: He never said that. The scene with the phone call - there was nothing about that in the script and nothing from Tom. That scene was quite difficult. It was the day that Obama won the election and I wasn't sad. It was also the day when Proposition 8 passed in California which rescinded gay marriage. I had just heard that John McCain lost. The sound guy played McCains concession speech. We sat in silent euphoria and I had to play a scene of absolute devastation.I had planned not to cry actually. But then Tom didn't cut the camera. So I was sitting there - I put the pone down. There it was a quiet, an empty room - he didnt cut. It was a silent direct. I thought this was fantastic. This was a moment where he just let me be there. It took ten minutes for the camera to run out if film, then there was silence. Then Tom said: Do you want to do it again? That was more difficult. I did it three times. I had to go back from devastated to happy because the scene starts happy. You have an interesting live outside of film with your charity work. Does that root in your childhood that you partly spent in Nigeria? Colin Firth: I don't know. My family travelled so much and I met people from extraordinarily diverse backgrounds, economic and social. I never ever felt territorial. My principles don't end with my passports or anybody elses passport. To me, theres just the human race. If compassion is worth anything its globally applicable. My father was a very popular teacher in Nigeria so I grew up surrounded by Nigerians. The majority of my friends are not English and most of my romantic relationships have not been with English people. So I do sort of see issues on a global level. I don't see geographical distance precluding caring. In your career, did you ever have moments where you thought this is the end? Colin Firth: When I made "Mamma Mia", I thought this is the end about eight times a day.I thought this is the end when I danced, or when I sang. Me and Stelan are actually good friends, and when we did the scenes we were actually having fun. It felt like a hen party. But right after we thought: oh my god what have we done.